There's been a lot of talk lately around Greenville, South Carolina about how to make this area more known for it's vibrant music scene. I often view these conversations with mild confusion, and amusement because I'm always left thinking “What in the hell are you people talking about?”. Being someone who actively searches for local shows, and new artists in my area, I see a scene that certainly isn't perfect, but is much more active than many people realize. I read articles, and social media chats on this topic, and always walk away thinking that many of the louder voices in the conversation aren't being entirely honest about what they want. We're in the middle of the bible belt, somewhere right around the buckle, so to say that a conservative viewpoint dominates the landscape is an understatement. The problem isn't a lack of music, it's a lack of the kind of music that the conservative crowd wants; they just won't come out, and say that. Although a perceived lack of "safe music" doesn't make a lot of sense to me considering the fact that you can't swing a dead cat without hitting some kind of Jimmy Buffet, or Lynyrd Skynyrd cover band. You can't please everyone, especially in regard to music, but we can at least recognize that there is something for everyone here. Media, and everyone else in this conversation doesn't have to enjoy it all, but it also shouldn't ignore what it doesn't understand, or appreciate. Even during these colder months there are several shows at various venues all across town, and in neighboring cities, so what's the problem? To hear some people tell it, there aren't enough “big names” coming through this area, and to a certain extent that's true. However, I remember a festival here not too long ago featuring Snoop Dogg that received loads of complaints from neighbors. This wasn't a house show, of course, but rather an event at the city's largest venue, an arena. Names don't get much bigger than international hip-hop legends, but apparently that's not what the powers that be are trying to draw. Indeed, the conservative voice seems to complain the loudest. The actual problem, or at least a large portion of it, is that any little old churchgoing lady can, and will complain about anything that isn't gospel or country. When it's a big event at the local arena, there's too much money being made for those complaints to be honored, but anything else is fair game. 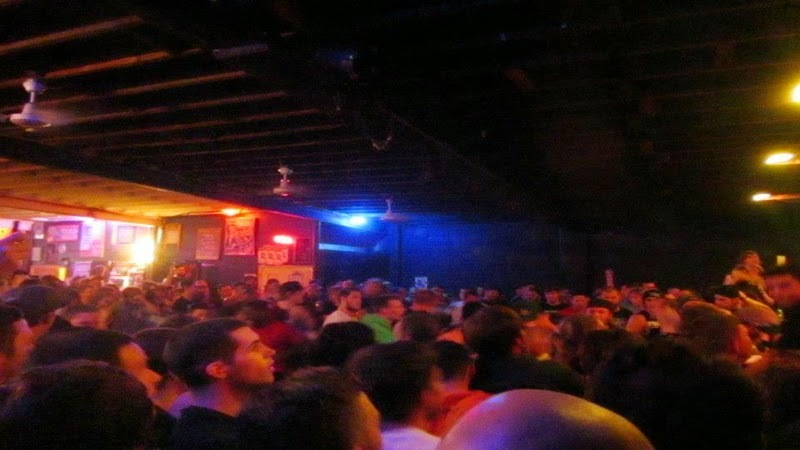 Even when you're within the noise ordinance laws, you can have your show shut down by just a few complaints. Ultimately, the issue of music in Greenville is just like any other issue, cash rules it's outcome. Why else do you think they want “big names” coming through here? As I type this, there is a show happening in a neighboring city featuring some very big names in the world of heavy metal, but do you think that show is getting any attention from the media? Of course it isn't, because it's not about pickup trucks, and “drinkin' the good stuff by the creek bed”, or “ooh girl, how'd you get them jeans on?” or some such redneck pop. The sad fact of the matter is, most people just want to hear covers while they sip that fizzy, yellow, corn chip water with a little alcohol in it that they call light beer. Plenty of us want to drink whiskey, and scream at the skies to the soundtrack of brutal heavy metal, but we just don't count in the eyes of many. Then there's the hip-hop crowd, the even more marginalized music fans in the area. For the average rapper in South Carolina, playing a show means doing one song at an open mic night because no one else will let you perform. It's funny how one of the most popular genres in the world somehow doesn't have a market in South Carolina. That isn't true, of course, but to hear some people tell it, no one here wants to hear hip-hop. This music discussion we've had lately doesn't seem like it's really about getting more music to the area, it seems more like an attempt at getting the kind of music that the upper-middle class wants. Again, this is an issue like any other, cash rules it's outcome. I understand that people have businesses to run, and money to make, but I can't stand when people tiptoe around an issue. We can have all the corporate sponsored TED talks we want, but until people say what they mean, and mean what they say, we're not gonna make much progress. I've been documenting the music scene in upstate South Carolina, and beyond for over three years now, and I assure you, there's tons of great music all around us. If it's not making much money, it's just as much the fault of the owners/promoters/media as it is the bands. We need a group effort, not venues, and bands pointing fingers at each other. When a businessman holds a talk about how there's no music around here, it makes me a little mad. There are loads of real artists out here working incredibly hard just to get a show, and get noticed. The Greenville DIY movement is the backbone of this area's music scene, and without all those people contributing, we actually would have next to nothing as far as music goes. Laws prohibit us from advertising these shows with fliers, but there are still big crowds showing up just from word-of-mouth promotion. When people act like there's no music here, it is not only an insult to the artists, it is an insult to the intelligence of every dedicated music fan in this state.